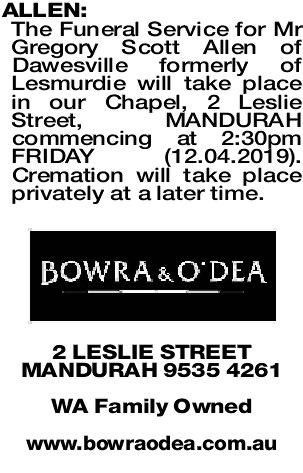 The Funeral Service for Mr Gregory Scott Allen of Dawesville formerly of Lesmurdie will take place in our Chapel, 2 Leslie Street, MANDURAH commencing at 2:30pm FRIDAY (12.04.2019). Cremation will take place privately at a later time. I knew you since we were kids Greg. Any time I think about you all I see is a smiling face. 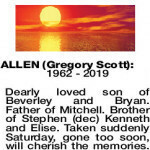 Really liked your company Greg and wish we had seen each other recently. 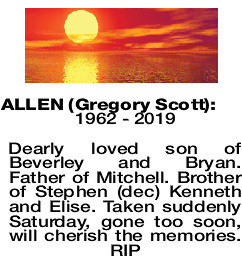 Will miss you but won't forget you Greg.